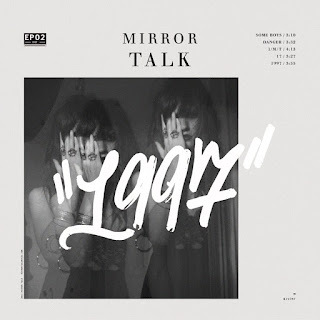 MELISMATIC: HEAR THIS: Mirror Talk Backtracks to "1997" for "1/M/T"
HEAR THIS: Mirror Talk Backtracks to "1997" for "1/M/T"
It can be argued that the overall sonic theme of 2015 was the full emergence of the 90's dance-house trend. If this excited you as much as it did me and you are also a fan of 80's New Wave, you need to jump on board this new artist bandwagon. They are called Mirror Talk. Based in Los Angeles, Mirror Talk is a four-piece synth band signed to Yellow Year Records. The released their second EP, 1997, a few months back and it is the second piece of an eventual trilogy with Tony Hoffer at the production helm (he worked on Goldfrapp's Seventh Tree, Foster the People's breakthrough Torches, and The Griswolds' Be Impressive). Mere seconds into single "1997" and I was all hands in for this foursome. It's gritty post-disco at it's best -- it takes no qualms (and no time at all) to draw you right in like a moth to a flame. Picture New Order meets Bronski Beat, shaken up and stirred during dark dance party during the 90's dance boom. It's the perfect, most accessible fusion served up as hooky, modern pop music. This is especially true for "1/M/T" ("One More Time"). Their sound is familiar but at the same time, breathlessly fresh and exciting. Concurrently, their style is pure theater -- homage to the ethos of horror.